Home » Blog » You’re invited to the Where To Bike Portland book launch party! You’re invited to the Where To Bike Portland book launch party! Join us! We’re celebrating the launch of the new cycling book, Where to Bike Portland! The book, written by our Deputy Director, Anne Lee, is geared toward recreational cyclists and families. 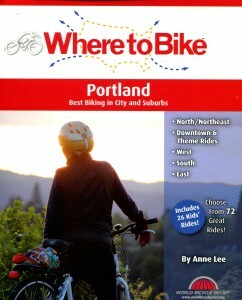 This is the first Pacific Northwest book in the Where to Bike guidebook series published by Bicycling Australia. What: Beer by Hopworks, tamales, and other refreshments. With 46 adult rides and 26 kid rides, there are numerous new ways to discover the city. Discover local history by riding to Fort Vancouver, or delight in discovering your favorite wall mural. Short or long, historical or savory, there are rides for every level of interest and skill. There is even an entire section just for young children learning to ride. This book is designed to make cycling accessible to all skill levels.